Have you ever wondered if all USB ports were all equal when it comes to their charging capacities? By now, we all know how some offer faster charging than others, which comes in handy if you’re pressed for time and can’t wait around forever for your device to charge all the way back to 100%. Well, if you’re just meticulous and attentive about that, you’ll surely take hold of what Power Practical’s Practical Meter. Indeed, it looks like a chunky USB flash drive, but in reality, it’s a nifty gizmo that can provide real-time feedback on how fast your device is charging. Essentially, the Practical Meter plugs into any full-sized USB port, where it’s then tethered to a device using the included fast-charging 3-in-1 cable. On the front of it, there are 5 LED-lit bars that light up to indicate the charging capacity of the USB port you’re using. Whether it’s the one from your computer, or from a wall charger, the Practical Meter gives us some insight to the amount of juice that a port is able to muster up. For example, a single lit up bar informs us that power coming from the USB port produces a stream of 1 watt – going as high up as 10 watts with all the bars lit up. So, what does this all mean? Well, it comes down to charging time. The higher the metering range (like 5 watts), the faster it can charge your device. Specifically, a stream of 5 watts could take a device approximately 1-2 hours to fully charger. In contrast, a stream of 2 watts could easily take over 4 hours. Honestly, this isn’t something for everyone – unless you’re really adamant of knowing the truth. Our main complaint is found with the 3-in-1 cable, seeing that it lacks the popular Lightning connector for iOS devices. 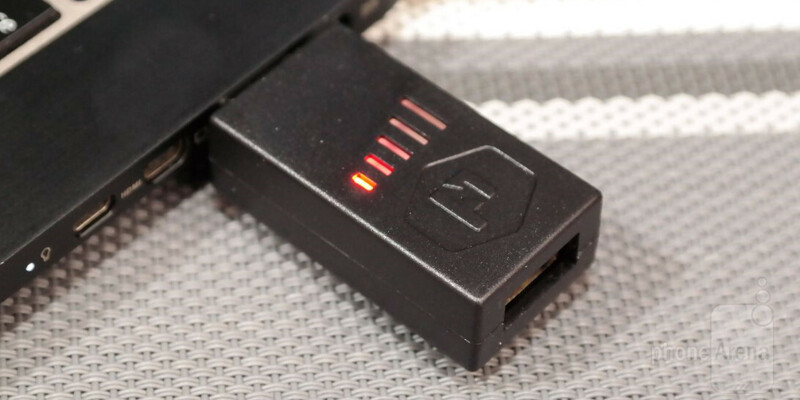 Attached with a retail price of $25, it’s something we can only recommend to folks who really care about knowing the approximate stream of their USB ports. If not, it’s best to just plug in, sit back, and wait for the ride to finish. First... About lightning cable. I think you need to blame apple instead of power practical. Lightning cable will bring price up by a lot, and will piss anyone that don't have iDevice. Agreed. However I would suggest PA to take a look at PortaPow's USB adapter for all USB chaging devices. It is smaller than the above item and is only as big as the tip of the finger. What it does is it allows for full charging capacity from the mains via ANY usb cable. I bought this device and found that it was terribly inconsistent. Didn't fit the usb ports well so the led's would go up and down depending on how you had it plugged in. I regret buying this device.